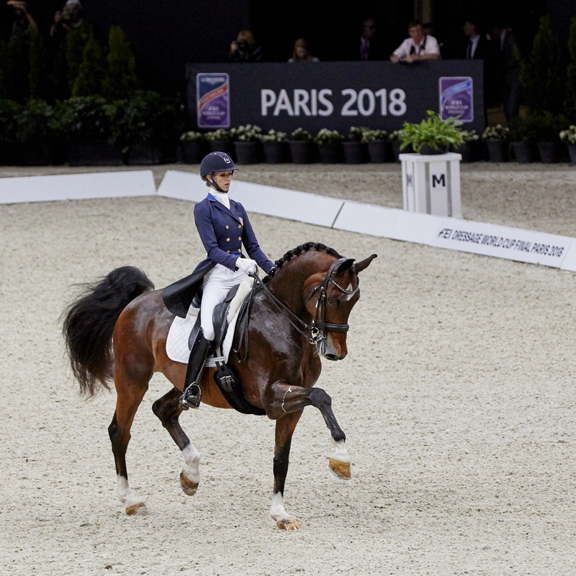 Friday April 13, 2018 – Laura Graves (30) has been threatening the supremacy of German superstar, Isabell Werth (48), for some time and on Friday April 13, 2018, the American pinned the most medaled athlete in the history of equestrian sport into runner-up spot in the Grand Prix at the FEI World Cup™ Dressage Final 2018 in Paris (FRA). Riding her beloved gelding Verdades, Graves was runner-up to Werth and her brilliant mare Weihegold at the 2017 Final in Omaha (USA) a year ago. Friday afternoon they proved that indeed they could outdo Werth, as the big horse she calls “Diddy,” and who she has owned since he was a foal, carried the Florida-based rider to a personal-best winning score of 81.413 with a performance that just oozed everything that’s great about a long-established partnership.